Constraints provide powerful ways to adjust bones without using the bone hierarchy. 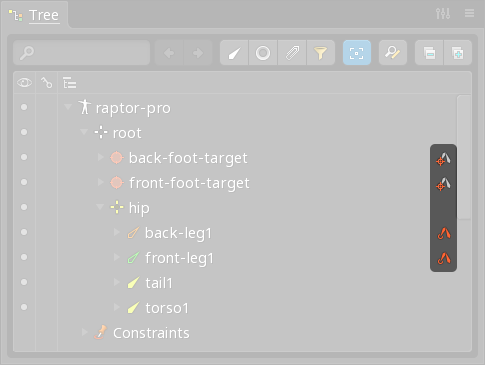 The right edge of the tree displays annotation icons for items that are constrained by or the target of a constraint. The icons can be clicked to select the constraint. 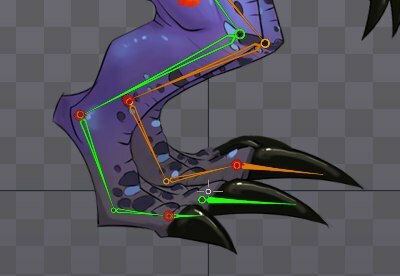 The editor area shows bones that are affected by a constraint as hollow. When a constraint is applied, the world transforms are recomputed for the constrained bones and all their descendants. If a constraint modifies a bone, then another constraint causes the world transform for that bone to be recomputed, the modifications made by the first constraint will be lost. Constraints are applied in the order they appear in the tree. In setup mode, constraints can be dragged up and down to change the order. When a constraint is created, Spine chooses a reasonable order. Click the Reset button to automatically calculate the order for all constraints.